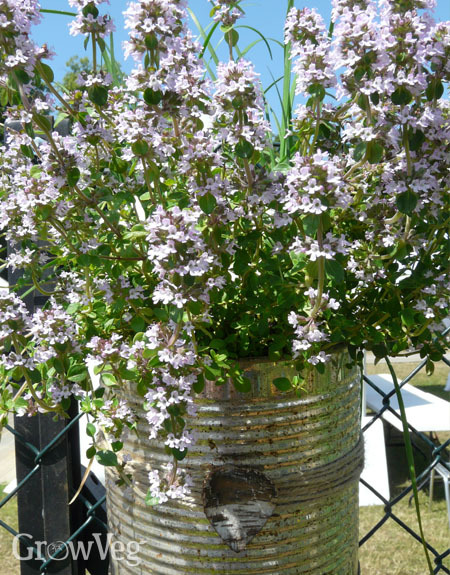 Container gardening is becoming more and more popular as people appreciate the flexibility and extra growing space it provides. Growing edible plants in containers does come with its own special challenges however, so if you want to succeed it pays to plan ahead. Most vegetable plants like lots of sun, so it’s important to site your containers where they will receive at least 6 hours of direct light a day. South or west facing locations are the best. Place them as close to your house as you can for easy access to your plants. Choose a sheltered spot for your pots, so your plants are kept out of cold, drying winds. Walls, fences and hedges are good locations, or try to screen the pots to reduce the effects of the wind. Using your window ledges and balconies is a great way to get started if you don’t have a garden but make sure your pots are properly secured to prevent them from blowing off. Watering is the number one priority for containers as the plants won’t have access to moisture below ground. On a hot sunny day they can dry out within hours and plants might not recover from serious wilting. Site containers as close to a water source as you can to make this an easy job. On hot days water plants thoroughly in the early morning or evening, making sure that you don’t just wet the surface but allow it to soak down to the roots. For convenience, drip irrigation can be installed - particularly useful if you will be away from home during part of the summer. Containers come in all shapes, sizes, colors and materials. Plastic and wood are tried and tested materials but you can unleash your creativity with recycled containers - just make sure they are clean and won’t leach harmful chemicals. Also make sure your chosen container is big enough and heavy enough for the fully-grown plants. It’s essential to provide good drainage to avoid waterlogging. Chech that there are adequate drainage holes and that they are free from dirt or blockages. Fill the container with a purchased potting soil or your own homemade compost. Don’t use soil from your garden, as this is likely to be heavy and to contain weeds or other soil-borne pests. A lightweight and moisture-retentive mix is best for containers, and it will need topping up each season to replenish nutrients that have been used up. Salads. Salad leaves only need a shallow container a few inches deep. If summers are hot in your location, choose an area that gets morning sunshine and afternoon shade to avoid the plants ‘bolting’ or running to seed before they’re ready for harvest. Cut-and-come-again type salad leaves can be harvested over several weeks by removing just a few outer leaves at a time, perfect for summer salads. Tomatoes. Tomatoes need plenty of soil to supply enough nutrients right up to harvest. Many varieties such as ‘Tumbling Tom’ can be grown in hanging baskets and look great as they trail towards the floor. Other varieties can be grown in potting soil bags, or you can use large pots at least 10in (25cm) in diameter. Make sure you use a stake and and tie the plants to it to keep them upright. Tomatoes are very thirsty so will need lots of water - at least twice a day in hot weather. Potatoes. Potatoes can be grown in large pots or bags and sacks designed specifically for the job. The seed potatoes (or potato eyes) are layered with the potting mix, left in a sunny spot and watered as required. As they grow, layer more soil around the stem of the shoots, gradually building it up over a few weeks until the top of the container is reached. Potatoes will develop all the way up the stem. Our Garden Planner has a range of specially designed garden objects to make planning and managing your container garden easy. 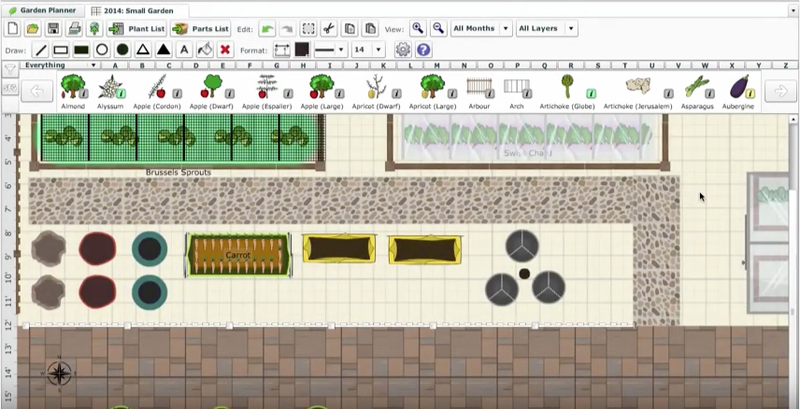 Starting with a basic outline of your garden, balcony or patio, you can then view Garden Objects in the selection bar. Click once to pick one up, move to where you want it to be and click to place it, rotating or resizing if required. Make sure you leave enough space around your containers for easy watering and harvesting. The Parts List will provide a useful summary of all the containers and other objects such as drip irrigation in your plan. Add plants into the relevant containers, and the Plant List will then show you a complete summary of what you are growing, including when to plant seeds indoors and outdoors, and when you can expect the harvest, specific to your location. Gardening in containers is an easy way of growing your own, and you can easily expand with more containers to fit the space you have. Whether you have one simple pot for herbs or a mini-farm full of plants it’s easy to get hooked on the taste of your growing your own fresh produce and the convenience of having them right outside your back door. "I luv your new site...thanks. Container gardening is how I have to further garden this year...better than not at all. I will stay posted here!" "i have loved this site and hope to learn more"
"I have been asked to help our daughter in law with ideas for planting herbs and vegetables on an area that is totally hard surface outside the premises where she prepares food for handicapped young people. Any help with knowing the depth of containers would be very helpful"